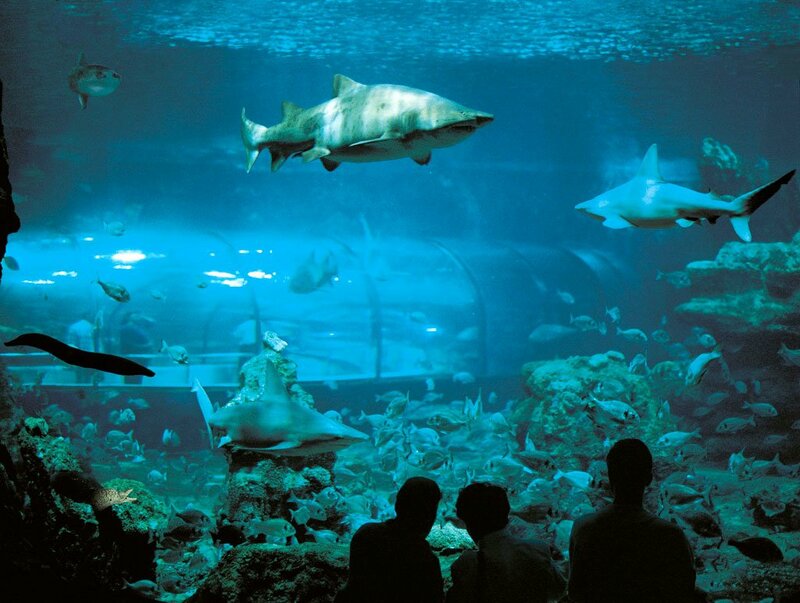 The spectacular Oceanarium, which is unique in Europe, is L’Aquàrium de Barcelona’s largest aquarium and home to the greatest number of species. With a diameter of 36 metres and depth of 5 metres, it contains almost 4 million litres of water. 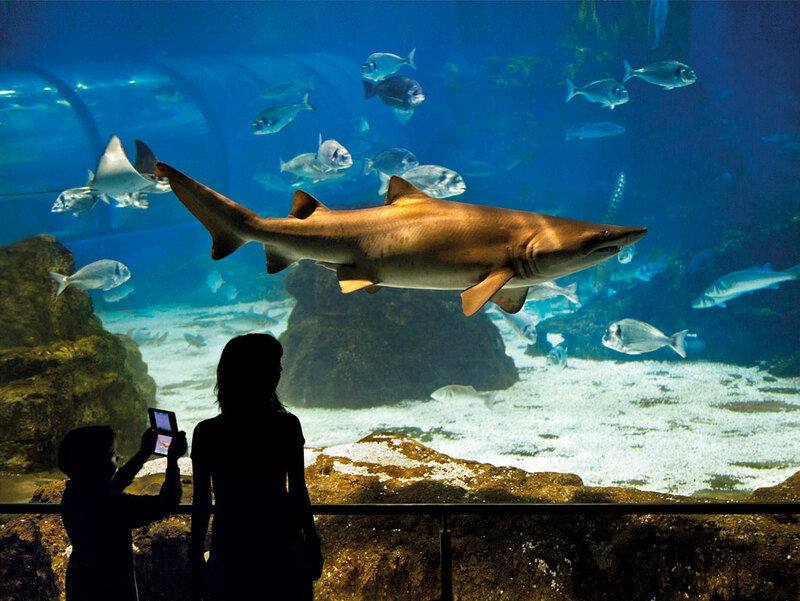 It houses species as diverse as giltheads, moray eels, ocean sunfish, rays and two types of shark: the sand tiger shark (Carcharias taurus) and the sandbar shark (Carcharhinus plumbeus) – the real stars of L’Aquàrium de Barcelona. 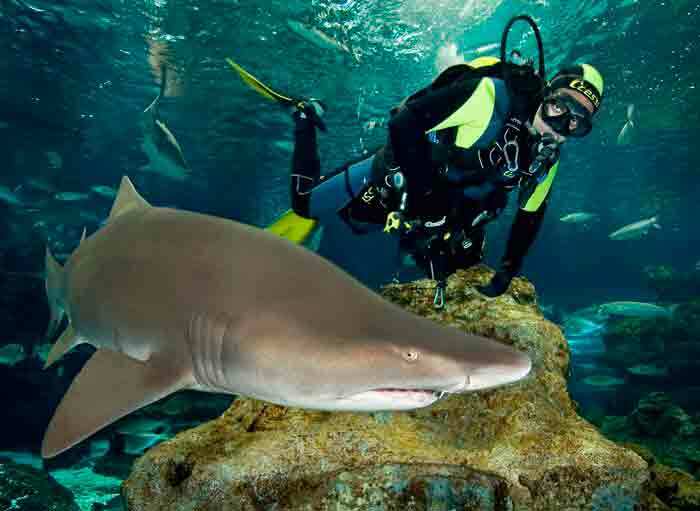 A transparent tunnel in excess of 80 metres in length enables you to enjoy a spectacular walk underwater. 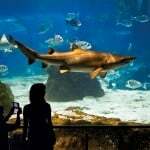 You can explore the Oceanarium from below and experience the exhilarating feeling of discovering the Mediterranean as if you were walking along the sea floor, just inches away from sharks and other curious species. 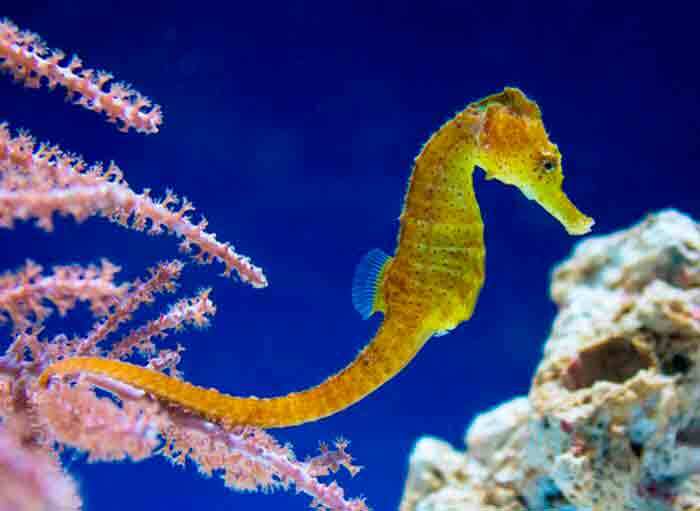 The Mediterranean Sea, with a length of 3,800 km, maximum width of 800 km, average depth of 1,500 m and points with up to 4,000 m deep is one of the largest marginal seas on the planet. 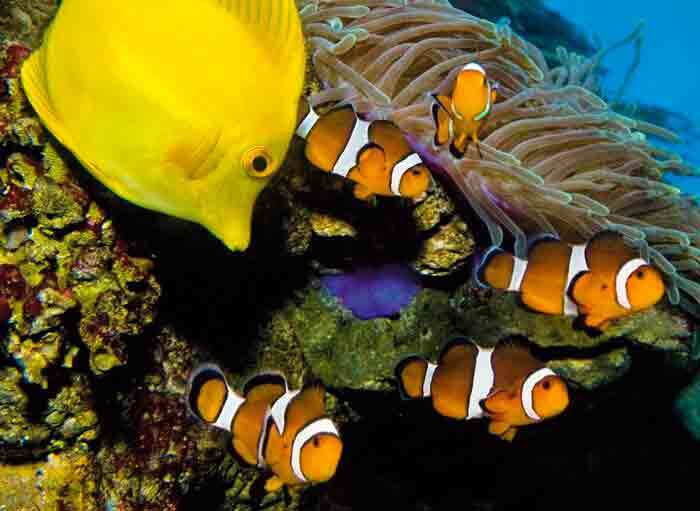 Despite being considered a nutrient-poor sea (oligotrophic), it hosts a diverse range of ecosystems and species. 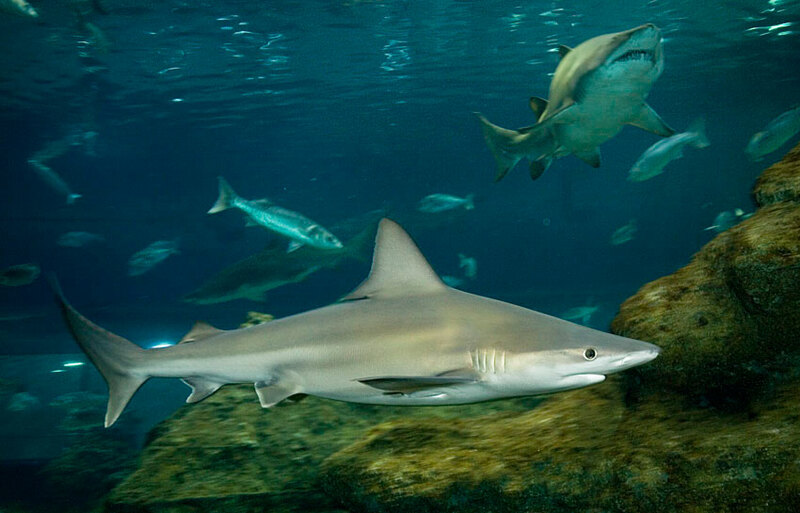 Most notable among them is an important predator: the shark. It is connected to the Atlantic Ocean by the Strait of Gibraltar and the Black Sea by the Bosporus. The small size of its basin and its narrow connection with the Atlantic cause its tides to have very low amplitude (around 25 cm), which gives the sea its unique appearance. 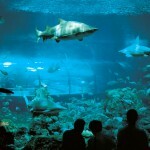 The Oceanarium is a microcosm of the Mediterranean Sea. 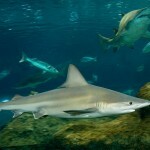 Fauna: Bluntnose sixgill shark (Hexanchus griseus); Atlantic wreckfish (Polyprion americanum); angular roughshark (Oxynotus centrina); common stingray (Dasyatis pastinaca); guitarfish (Rhinobatos rhinobatos); vadigo (Campogramma glaycos); false scad (Caranx rhonchus); leerfish (Lichia amia); pilot fish (Naucrates ductor); mahi-mahi (Coryphaena hippurus); Guinean grunt (Parapristipoma humile); rubber-lip grunt (Plectorhinchus mediterraneus); meagre (Argyrosomus regius); bullet tuna (Auxis rochei); rudderfish (Centrolophus niger); turbot (Psetta maxima); sand tiger shark (Carcharias taurus); sandbar shark (Carcharhinus plumbeus); ocean sunfish (Mola mola).